Marina Cousins, a high school senior working in the lab of College of Arts and Sciences Dean Karin Ruhlandt, participated in the Intel International Science and Engineering Fair in Pittsburgh, Pennsylvania, in May. A high school student working in the lab of College of Arts and Sciences Dean Karin Ruhlandt participated in the Intel International Science and Engineering Fair in Pittsburgh, Pennsylvania, in May. Marina Cousins, a senior at Manlius-Pebble Hill School, was selected to attend in March after winning top honors at the 39th annual Central New York Science and Engineering Fair, organized by the Milton J. Rubenstein Museum of Science & Technology. She was one of three winners of an all-expense-paid trip to the Pittsburgh event. Cousins contacted Ruhlandt last year about working in her lab during the summer, and Gillett-Kunnath interviewed her for a position. Gillett-Kunnath says Cousins’ questions and her enthusiasm and interest in the research stood out to her. “It brings a smile as I recall this because this is truly who Marina is—she shines among all others and is one of the best students that I have had the privilege to work with,” she says. 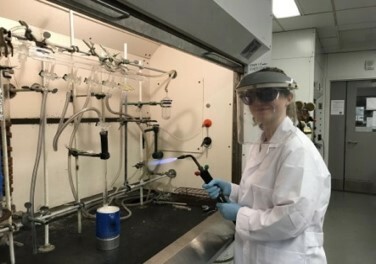 The goal of Marina Cousins’ research is to create a compound that can efficiently deposit a thin film of metal oxide based on calcium, strontium or barium—that can be used in semiconductors. Cousins connected with Ruhlandt after hearing about her research from Ruhlandt’s daughter. 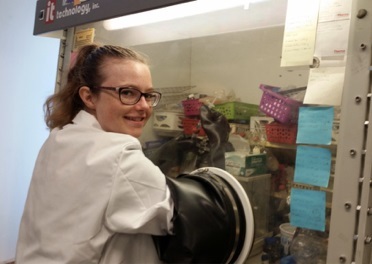 Her work in Ruhlandt’s research lab and her ability to quickly learn and master new knowledge led to Ruhlandt and Gillett-Kunnath allowing her to start her own project, a graduate-level thesis project, in the lab. Cousins worked in the lab Thursdays after school and Saturday mornings on a project they designed together. “Marina was interested in MOCVD as it has both chemistry and engineering applications—something she wants to pursue as an undergrad,” Gillett-Kunnath says. MOCVD, metal organic chemical vapor deposition, is a technology that deposits layers of atoms to be used in a semiconductor. The goal of Cousins’ research is to create a compound that can efficiently deposit a thin film of metal oxide—based on calcium, strontium or barium—that can be used in semiconductors. Cousins also presented at the 2017 Syracuse University Research Experience for Undergraduates poster session and the poster session at the American Chemical Society National Meeting in New Orleans in March. At the Central New York Science and Engineering Fair, she earned three awards and high honors, along with the invite to Pittsburgh. This summer, Cousins, who will head to Union College for engineering this fall, will continue working in the lab to finish up the research, collaborate on publishing papers, and mentor new high school students.